Subscribe to our FREE e-news crop reports. Rain fell at last in parts of Texas and Oklahoma. Dryland is still in the 11th hour after 100+ heat and no soil moisture. Some New Mexico growers also got a rain break. Wayne McAlister said that means getting 2 months of work done in 2 weeks. Residual herbicides reportedly are working well, but Stu Duncan in Kansas reports that weed control might be credited to dry weather in some areas. Thrips sprays still happening, especially in the Panhandle-South Plains areas. The Boll Weevil Eradication Program has been active in the Rio Grande Valley where most fields are in full bloom and bolls are coming on. 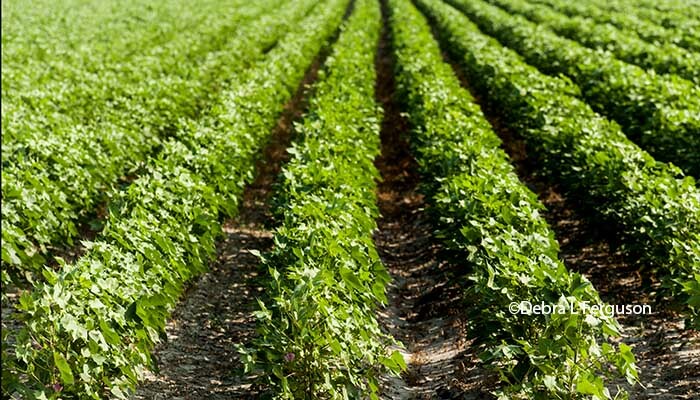 Scroll down to read our latest AgFax News Links. Chris Locke, CSL Consulting Inc., Sudan, Texas/Eastern New Mexico: “We got 1 inch of rain Sunday night (6/3) in parts of Bailey and Cochran counties. It was spotty at best, but some areas received some nice showers. It really helps the irrigated, but may be too late for the dryland. There’s no soil moisture under it. It’s getting late in the game for dryland to come up. There still may be enough time farther south if we get more rain and cotton is up and going by June 10. But farther north in Parmer County, I feel like it’s too late for most dryland. “The irrigated has good stands for the most part. It’s anywhere from just emerging to 4 to 5 true leaves. Along with the heat, we’ve had a lot of thrips pressure. They remain pretty heavy. Some older fields have already been sprayed twice for thrips. We don’t expect much fleahopper pressure when plants begin to square because we have few host weeds for them. “We’re seeing fewer weeds due to dry weather. The preemergence herbicides have been hit or miss, mainly due to how they were incorporated. If it was done mechanically, the pres did pretty well. But incorporation wasn’t as good if they depended on rain or irrigation. Jason Woodward, Texas A&M AgriLife Extension Plant Pathologist (Cotton & Peanuts), Lubbock: “Several things are affecting emergence, namely extremely hot and dry conditions where moisture is not sticking around and seed is drying out. Also, soil temperatures are extremely hot at the surface, which makes it difficult for plants when the cotelydon first unfurls. “We’ve seen some seedling disease due to light irrigations, which make conditions favorable for fungi. There are some situations where stands have lessened. “We’re seeing nematode activity on early cotton and on weed hosts. I’m afraid that under dry conditions, nematodes are going to rear their ugly heads. For reniform nematodes, we’re fortunate that farmers are seeing some good results by planting root knot nematode resistant varieties. Our research is showing promise for reniform resistant varieties in our trials. Seth Byrd, Oklahoma State University Extension Cotton Specialist, Stillwater/Altus: “We missed much of the rain they received in the Texas South Plains this weekend and we could certainly use some moisture. Some guys got planted in good moisture, but need more rain after heat and high winds dried things out. I’d say we’re about 50% planted. Most irrigated has been planted but a lot of dryland guys are holding off until they receive some rain. “Cotton we have up looks good. Fields planted northeast of Altus near Ft. Cobb look great. Fortunately, there’s not much of a problem with thrips. That’s probably because wheat is drying out and maturing earlier than usual after the hot weather. “Weed pressure is also light. Most guys have a good weed control program going. They’re doing a good job of using word of mouth to make sure neighbors know what type of herbicide technology they’re using. They’re talking to each other. Cody Noggler, Crop Quest Consulting, Northwestern Texas Panhandle: “We have everything up and going finally in Moore, Sherman and parts of Oldham counties. Nearly all cotton is at the 3 to 5-leaf stage. “We’ve been spraying for thrips and will be watching for fleahoppers when we get to squaring. We’re not seeing any disease, but expect some verticillium wilt later in the season. Stu Duncan, Kansas State University Crops & Soils Specialist, Manhattan, Kansas: “We’re still spotty on rain and most areas still need some. Growers are nearly finished planting and things are coming right along. Cotton that’s up ranges from just emerged to 1 to 2 true leaves. “There are some thrips out there and some potential for damage. Producers need to scout their fields and determine if they need to spray. Some are seeing some rhizoctonia in the south central part of the state. Gaylon Morgan, Texas A&M AgriLife State Cotton Specialist, College Station: “We caught a little rain in the southern Blacklands and Brazos Bottom on Sunday (6/3), which will get us further down the road. Unfortunately, they didn’t get a lot of rain in other areas. In the Temple area and north in the central Blacklands it’s pretty dry. “The crop is hanging in there in those regions. Some is at mid-square and some is at first bloom. As you move down the coast, they caught rain a couple of weeks ago but are running out of moisture now. Still, the cotton looks good, better than corn and sorghum. “As for insects, spider mites are lingering with the heat in parts of the Blacklands. Some growers have sprayed twice for them. We’re also seeing fleahoppers but I haven’t heard of any high level populations. Danielle Sekula Ortiz, Texas A&M AgriLife IPM Agent, Weslaco/Lower Rio Grande Valley: “The cotton looks good overall, even though we are very dry. The majority of the fields are at full bloom. We’re seeing medium and larger size bolls. A lot of fields are at 6 to 7 NAWF. “The dry weather and heat has caused irrigated guys to apply 2 extra waterings. Those with dryland are already seeing cutout. Some lost their acres due to the heat and because it was too dry. Some guys are not sure if they should bother spraying because yields will be so low. “We’re seeing some white fly activity. There are also aphids here and there, as well as a few plant bugs, but nothing major. A majority of the guys are putting out PGRs for cotton that is tall. I also know that the Boll Weevil Eradication program has needed quite a bit of spraying lately. Randy Norton, University of Arizona Extension Cotton Specialist, Safford: “We’ve been at 105 to 106 in this area, but not like the 108 they had in the Texas Panhandle last week. Still, with the season we’re in, it’s important for growers to watch their irrigation. They need to keep cotton watered to help prevent plant stress from heat. As the cotton starts to fruit, we need to prevent the loss of squares to heat stress. “Overall the crop is looking good. We have fields that are flowering in the Yuma area out west and fields that are squaring in the central part of the state. I’ve seen some fleahoppers, but nothing that needs treatment. DeWayne Dopslauf, Crop Production Services, Wharton, Texas: “With the dry weather, we’re starting to irrigate cotton where we can. I’d say about 70% of what I check is starting to bloom. Then there’s some other cotton that just came up after catching a stray shower. “We finished spraying for fleahoppers last week, but are monitoring for further outbreaks. As dry as it is, we need every square we can count. A few stinkbugs have been seen on older cotton, around tree lines and coming out of cornfields. I noticed some bollworm moths flying around today (6/4), but we’re not very concerned because we use either Bollgard 3 or WideStrike 3 technology. Peter Dotray, Texas Tech University Weed Scientist (joint appointment with Texas A&M AgriLife), Lubbock: “We received some nice rain over the weekend, but there are still a lot of places where it’s dry, dry, dry. There aren’t serious weed issues in those areas. The good news is that where fields have had some rain, residual herbicides are working and controlling weeds. It’s pretty apparent that yellows and other pres are doing their thing. Where they were not used, cotton coming out of the ground will see weeds coming out too. That means the use of post-emergence herbicides is important. “I’m seeing good results from Liberty. The key with Liberty is to treat weeds less than 3 inches tall. They need a thorough coverage – a minimum of 15 gpa and maybe up to 18 gpa – to get it done right. Applications at higher humidity and away from the heat of the day should provide better results. “As cotton continues to grow, we’re just starting to gear up for dicamba and 2, 4-D formulations. I’m hoping folks are aware of the surrounding environments adjacent to their fields. Be sure to pay attention to the wind speed and direction. Use the appropriate nozzle selection and tank mix partners. These factors are all very important for on-target applications. It all needs to happen to insure these new technologies are going to be around for years to come. Wayne McAlister, Crop Production Services, Portales, New Mexico: “It has been a circus. We have been too dry and no one could do anything. Now, with the rain we’ve had, we have 2 weeks to do 2 months of work. “In eastern New Mexico, we got some small rains that really helped. We dodged hail in most spots, but they had damage around Clovis and lost some cotton and chili peppers. We treated for thrips and haven’t seen any critical situations yet. There’s no disease, other than wilt from the heat. Scott Fuchs, PhytoGen Cotton Development Specialist, San Angelo/Concho Valley: “We finally received rain last night (6/3) – about 0.7 of an inch in San Angelo and up to 1 to 2 inches in other areas. That will help, because we’ve been extremely dry. Many dryland growers will get into the fields as soon as they can and hope for more moisture. “Most irrigated cotton has been planted and some fields are at the 2-true-leaf stage. Overall, we’re anywhere from there to still in the bag to just emerging. Some dryland got planted after the early May rains but, some growers couldn’t finish because it turned terribly hot and dry and the soil moisture dissipated. We also had strong southwestern winds coupled with extreme temperatures, which made seedling emergence extremely difficult. “We’ll be watching for weeds after this recent rain. Many progressive growers are looking at the new technologies, either our Enlist varieties or Monsanto’s Xtend varieties, to manage Roundup-resistant weeds. “It’s vital that growers are cognizant of wind speed and direction before they spray. Our label states Enlist may be sprayed with wind at 3 to 10 mph. We want some wind present to prevent spray particles becoming suspended – resembling a haze or fog – then move hours later if a wind comes up. If the air seems too calm, growers can use a small smoke bomb to determine if the smoke moves or remains stationary. “Also, any grower applying either Enlist or Xtend needs to make sure their nozzles are on the approved list to prevent off-target drift. They should also make sure their fields are marked with specific flags to match the herbicide they’re applying. Unfortunately, not enough growers are using flags. Using proper flags is a good way to mark specific technologies and prevent unwanted herbicide applications. “In addition, a triple-rinse tank cleanout is a must to prevent unlabeled herbicide application. We all need to do what we can to make sure we have access to new herbicide technologies to help manage resistant weeds. “Insect-wise, I haven’t heard or seen any problems in our area thus far. Thrips are typically not a pest that we worry about annually. They’re typically more cosmetic and don’t require spraying. We’re still a couple of weeks away from squaring in our earlier cotton, so fleahoppers are not yet a problem. "Wireworms are an issue farther north and west, but we usually don’t see any in the Concho Valley. However, they have had them in the Garden City and St. Lawrence areas. Many of those growers plant insecticide treated seed, or apply an insecticide in-furrow. “A problem we’ve faced for 5 to 10 years or more is reniform nematodes. Growers are looking at the Texas AgriLife research that list varieties that are resistant to root knot nematodes. Some of these products work fairly well against reniform nematodes.